Finnish composer Pehr Henrik Nordgren died in 2008, leaving a legacy of 8 symphonies, no less than 25 concertos for diverse instruments,11 string quartets and much else. He wrote more for the string orchestra than any other Finnish composer. Largely self-taught, he was fiercely proud of his independent approach to composition, never being wedded solely to one theory or style of composition. 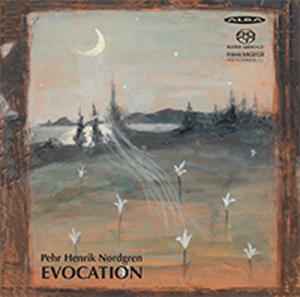 Deeply interested in Finnish folk music of all types, his sound world develops from superimposition of many melodic strands, a "melodic-polyphonic cluster technique" as he called it. 12 note tone rows are also sometimes a feature. 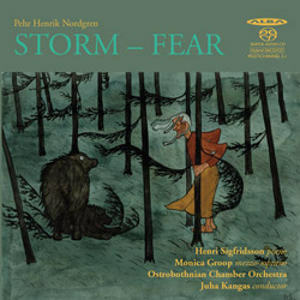 A 40-year partnership with violinist Juha Kangas, founder of the Ostrobothnian Chamber Orchestra, has been a major impetus for Nordgren&apos;s composing career. 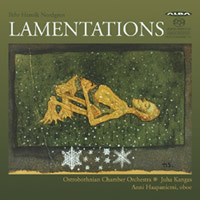 The OCO is now regarded as a world-class string orchestra, and this disc, with its title of &apos;Lamentations&apos;, appears to be a fitting tribute from Kangas and his players to Nordgren. The five-movement Symphony for Strings Op.43 from 1978 is a strongly expressionist work. 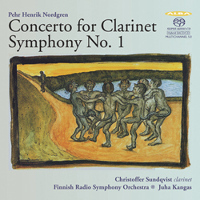 Nordgren eschews any of the standard symphonic forms, but its Andantino First Movement can be regarded as Exposition. The Second (Con moto) and passionate Third (Espressivo) represent two forms of development. The Intermezzo aims to give the final funereal Adagio a sharper focus; it is an epilogue. There are no folk song allusions at all in this piece. On the whole it has an elegiac, bleak and strongly dissonant nature. 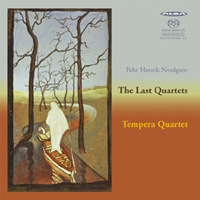 The Second Movement has some challenging technical features which the superb players take in their stride - eerie glissandi, startling string-slaps (particularly from cellos and basses) and an astonishing soft crepuscular pizzicato section which recalls Bartok&apos;s imitations of insect sounds from the Hungarian plains. The 1982 Concerto for Strings Op. 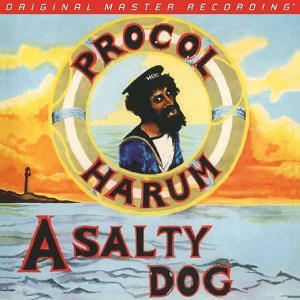 54 is really a fantasia, with its three movements given titles: &apos;Premonitions of bad days&apos; (suspenseful hushed opening, with gently probing string chords), &apos;Dance away your worries&apos; (a vigorous, gritty and startlingly dissonant whirl of passionate energy) and &apos;A belated prayer for achieving fulfilment&apos; (slow folk-choral building in intensity, but no tonal chords for resolution, just a few upward-striving melodic lines). 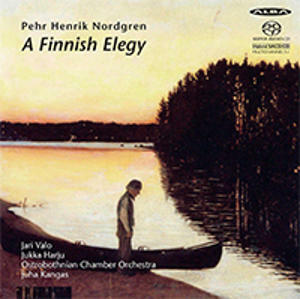 After these two rather unrelievedly stark and gloomy works, Nordgren&apos;s solidly tonal setting of an ancient Finnish hymn &apos;The Whole World Will Lament&apos; Op. 26b (1974) brings a richly sonorous string sound with many textural variations. The welcome warmth of this setting belies its title. The programme ends with a recent composition, a Concerto for Oboe and Strings, Op. 116, written in 2001 for Anni Haapaniemi. Although she asked for a solo part which went beyond the traditional pastoral writing for oboe, the single-movement work is gentle, calm and contemplative. 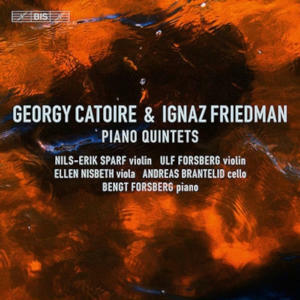 It opens with a hazy shimmer of quiet strings, the soloist leaping in with a folk-like motif which has characteristic drooping glissandi and some &apos;note-bending&apos;. The rhapsodic development of this motif occupies most of the concerto, requiring superb breath control and emotional expression rather than displays of agility. Anni Haapaniemi&apos;s ability to spin and sustain long, convoluted lines is hypnotic, especially as the piece lasts for over 20 minutes. 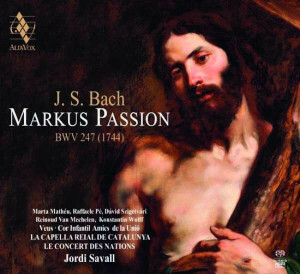 The strings are mostly used very sparingly in accompaniment, often with delicate pianissimo ostinati. An unaccompanied cadenza section makes references to bird-song, and she beautifully voices this with pure and creamy tone. The Snellman Hall in Kokkola, Western Ostrobothnia, where Nordgren spent much of his career, is the recording venue. Juhas Kanga and his totally-committed string players are given a very immediate and detailed sound, with their wide dynamic range well-captured (especially such beautifully produced pianissimi). I could have done with a little more ambience from the hall though, to open the textures a little more and provide better front-back perspective. While not exactly dry, there is no really distinctive ambience from the hall. Perhaps listeners would be better savouring one work at a time, rather than listening through the whole disc at once. Most of the music is slow, strongly dissonant and sometimes angry or aggressive, although the prevailing mood is, as the title tells us, of lamentation. Nevertheless, this disc is a unique and touching tribute to the fruitful working relationship between Nordgren and Kangas, both self-taught and both often at the mercy of scholars and critics.